Walrus Audio Aetos Review – Best Small / Medium Pedalboard Power Supply? After reviewing the Walrus Audio Janus fuzz/tremolo and Descent reverb, I fell in love with the unique design aesthetic of this company and their quality guitar pedals. Naturally, I was very excited to hear about the Walrus Audio Aetos as who better to make a pedal power supply than a company who also specializes in making the products it powers. It’s a unique position for a pedal maker to release a power supply as they should be more in tune with the needs of their customers: pedal users! Aimed at the guitarist who uses up to around 8 pedals (and perhaps more! ), this little unit looks like a contender for the best small/medium pedalboard power supply available. Below is a list of its features before we dive into our Walrus Audio Aetos review. 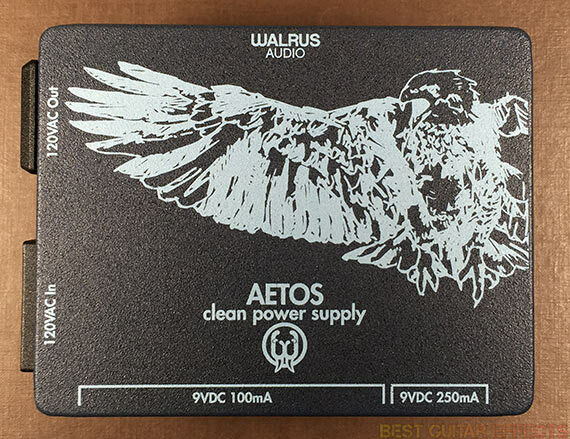 Visit Walrus Audio for more info about the Aetos Clean Power Supply. Your power supply is probably the single most important piece of gear on your pedalboard. All your fancy pedals won’t mean a thing if your power supply is junk. Also, please understand that I am very skeptical of new power supplies. Trust me, they all are not created equal. If you’ve ever had a cheap power supply burn out in the middle of a gig, you know what I’m talking about. So while I’m going to talk about the features of the Walrus Audio Aetos and how beneficial they may be to guitarists, my reliability test is probably the most important aspect of this review. I got my hands on this unit over 90 days before writing this review. While it wouldn’t have taken too long to learn the ins and outs of the Aetos and write a quick review, I did something a little different. I plugged in the Walrus Audio Aetos and left it on for 6-8 hours or more nearly every day for a straight month. I have also been using it as my main power supply for testing pedals and powering pedals in our recent review videos. I also usually run at least one pedal off of an external wall-wart power supply from the Aetos’ complimentary power output. So my report so far in the few months I’ve been using the Aetos is that all is well. If my previous experience with Walrus Audio products including the Janus and Descent is any indication, the Aetos should be a gig worthy power supply that will hold up to the powering needs demanded of it. The Aetos has 8 output jacks on the front side of the unit. 6 of them are 9VDC outputs for lower power consumption pedals that require only 100 mA of power or less. This includes most standard-sized stompbox pedals (fuzz, distortion, overdrive, etc.). Walrus Audio’s own Janus is an example of a lower power consumption pedal. The remaining 2 9VDC 250 mA power outputs give you a little more power for pedals that require more than 100 mA. Walrus Audio’s Descent is an example here. As always, check your product manuals to find out the power requirements for your pedals before plugging them into the wrong outputs. Some pedals can be damaged from wrong current/voltage sources. Use common sense, and you’ll be okay. is probably the most valuable feature on a power supply. One of the biggest benefits of the Aetos is its courtesy outlet. 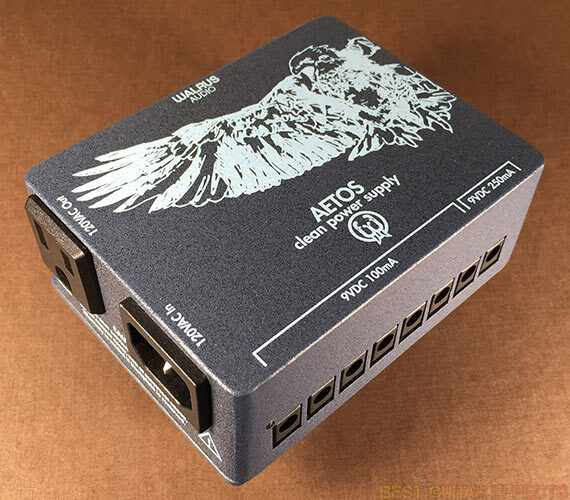 This lets you plug in any other device to the Aetos via their own dedicated power supply. Say you have a pedal that requires 450 mA. Use that pedal’s power supply in this output. Maybe you have a special wireless system on your pedalboard with some special power requirement. Plug it in here. You could even use an outlet splitter to plug in a few extra wall warts if necessary. Basically, when you’re laying your pedalboard out on stage for a gig, it’s usually best if you only have to plug in one central power cord to get juice to everything on your board. This extra outlet on the Aetos ensures that it’ll probably be the only thing you need to plug in. Practical and essential. Also, while the 8 power outputs on the front let you power up to 8 pedals (assuming you’re not using a separately purchased power splitter cable to power even more pedals), the extra output lets you add at least one more pedal for 9 or more total pedals from this single power hub. Very cool. Also, as the full product name implies, yes, this is a “clean power supply”. If you’re a first time power supply buyer and are ready to step up from daisy-chaining your pedals or using batteries for power, know that having a fully isolated power supply like the Aetos will alleviate your signal from potential noise issues and interference caused from cheap non-isolated power supplies or daisy-chaining pedals in series. The unit also includes 8 standard Boss-style power cables and 2 Line 6-style power cables. All in all, the Aetos is a sensible and rugged little unit built by a company that already has a reputation for making quality pedals. Sounds like a winner to me. Let’s see the final result. The Walrus Audio Aetos is a thoughtfully designed power supply that should provide enough juice for most small to medium sized pedalboards. With 8 total 9VDC output jacks (6x100mA & 2x 250mA) and an extra power outlet, it has the capability to ensure everything on your pedalboard is powered up by simply plugging in your Aetos at your gigs. This thing is solid and a cool foray by Walrus Audio into other useful and well-designed products for effects pedal using guitarists. This is definitely one of the best small to medium sized pedalboard power supplies around, so check it out. That concludes our Walrus Audio Aetos review. Thanks for reading. Want to buy the Walrus Audio Aetos?